A Pakistani military air base has been attacked by gunmen triggering a fierce fire-fight with security forces that lasted several hours. Several militants wearing military uniforms and suicide belts stormed Minhas air base at Kamra, near the capital Islamabad, just before dawn. Eight militants were killed, say officials, one soldier died and the base commander was seriously injured. All of Pakistan’s air bases were placed on high alert following the attack. 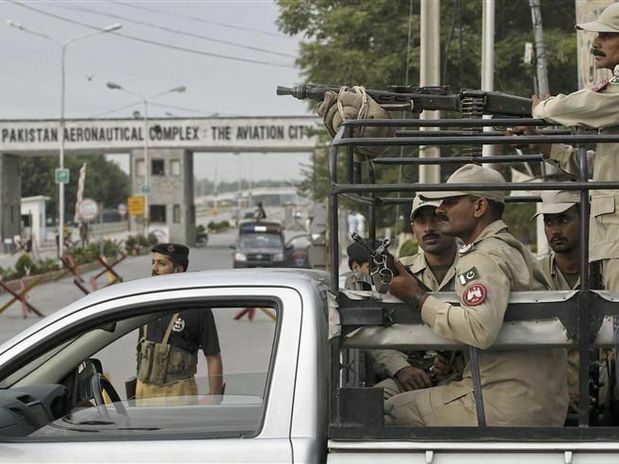 Shortly after the attack began, at around 02:00 local time a police officer outside the air base, Hafeez Aulakh, said he could hear intense gunfire and see flames leaping up from inside, the Associated Press news agency reported. Militants did not reach the hangars inside the base, the air force said, although rocket-propelled grenades fired from outside are said to have damaged one aircraft. Reporters who reached the scene several hours later said there was no sound of gunfire. “Security personnel are now in the process of scanning the entire area,” an air force spokesman said. Base commander Air Commodore Muhammad Azam was reported to be seriously wounded but in a stable condition in hospital. Earlier reports said two soldiers had died, but this was later revised. Officials have denied speculation that there were nuclear weapons stored at the site. It was not immediately clear how the attackers managed to enter the base. Minhas is one of Pakistan’s biggest air bases with about 30 fighter jets including new JF-17 planes – jointly developed with China – that are being assembled there. It is about 60km (35 miles) north-west of Islamabad. No group has said it carried out the attack but Islamist militants linked to the Pakistani Taliban have previously targeted military bases. In May 2011, militants attacked the Mehran naval air base in Karachi, killing 10 soldiers. It took security forces about 17 hours to secure the base on that occasion. In 2009 a suicide bomber killed six people at a military checkpoint in Kamra, in Punjab province.